Traffic Control Flaggers Seek Attention! They stand on roads and demand attention. But it’s all for the public good. The attention-seekers are flaggers, the unsung heroes of traffic control. Once a traffic management project is underway, Traffic Control Flaggers are responsible for protecting it all – work crews, pedestrians, bicyclists, motorists and equipment. Fully prepared for this challenge, the expert flaggers on the team of Roadway Construction Services (RCS) have been a major factor in our high safety standards. Ensuring equipment on trucks is organized and functioning properly. Flaggers must keep track of endless variables — just holding a flag in the right position requires consummate concentration. Therefore, RCS has established a set of strict guidelines for those on our team. But fostering the right skills don’t stop with us. RCS flaggers also must satisfy stringent state requirements. For smaller projects, one flagger is usually sufficient. Larger projects, however, typically involve flaggers positioned on either side of the work zone – a major coordination effort. Communicating with two-way radios or hand signals, multiple flaggers offer the coverage needed to monitor and direct a wider area of traffic conditions. 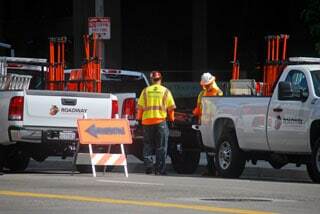 Whether single or multiple, flaggers support their efforts with various traffic control tools. These include cones and orange barrels. Our thoroughly trained and prepared flaggers and traffic control technicians are just one of the factors that ensure maximum project safety. If you’re interested in learning more about our unsurpassed safety as well as overall performance, contact RCS today. You’ll soon discover why we’re the go-to traffic control service in Los Angeles and all of Southern California.